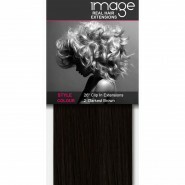 Our darkest brown clip in hair extensions will let you effortlessly create the look you desire. The full head clip in sets are made from the highest quality human hair and will stay looking sleek and shiny, so that all you have to worry about is having a good time! IMAGE remi hair extensions are available in a huge selection of colours to suit everyone, so if you're one of the lucky few with gorgeous dark locks, then these darkest brown extensions are guranteed to match your style and have your hair looking fabulously long in no time. Try our interactive colour chart to find the perfect shade to match your hair. Get a super-big bun today with our XL Big Hair Bun - it's bunbelieveable! Go long with our range of 26" extensions, now available in deluxe double-weft. 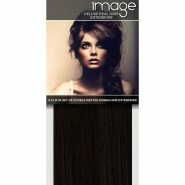 At IMAGE our passion is providing the highest quality real clip in hair extensions at the best prices. As a UK stockist, we source only the finest human hair to create our extensions meaning that all you have to worry about is clipping them in and creating the latest and hottest hair styles.